I have been waiting for weeks now to wear this polka dot jumpsuit and finally the weather started to cooperate. This is the perfect springtime look and we all know I am a sucker for all things polka dots (one of my favorite summer dresses seen here). I paired this look with a pair of wedge espadrilles, a neutral bag, cat-eye sunglasses (use code FASHINNY15 for $15 off!) and a pair of gold tone & pave earrings that I haven't taken off since I got them. 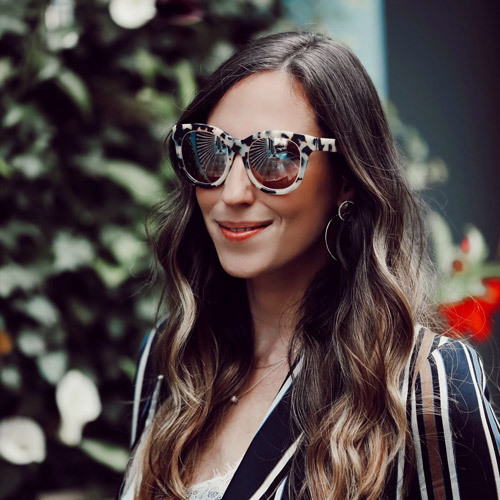 I wore this look as I headed to a global pop up shop in the West Village with Amorepacific- the Pop up shop is open for only a few more days (read more here) but in case you miss it you can shop my picks below.